I have good news and bad news. First, the good news: I finally get off school for Christmas break tomorrow. What a relief -- I could really use a holiday right about now. Now, the bad news… I can't find the snow. It's hiding somewhere. I don't know about you, but it just doesn't feel like Christmas without that beautiful blanket of pure white covering the roads and sidewalks outside. Those beautiful snowflakes -- where have they gone? Geez, come on, weather. You have only a few days to redeem yourself. My most recent baking venture was for a potluck my math class is holding tomorrow. "Potluck" is a word I have seen over and over again for the past few years, but I only just learned its meaning a couple of days ago. It's a party where each of the guests contribute by bringing food. We were supposed to bring in a food native to our cultural background, so since my family's background is Italian, the first thing that came to my mind was biscotti. Biscotti are Italian cookies that are baked not once, but twice, and the result is a hard biscuit that is usually quite dry. The biscotti are often flecked with add-ins, like almonds. This recipe for biscotti, however, is not exactly traditional. I was looking for a new twist, found it, and loved it, but my Nonna would probably laugh if I told her... unless she tried one of these untraditional biscotti, in which case I have reason to believe she would change her mind. The dough is studded with chopped Oreo cookies. Yes, Oreos -- the cream-filled chocolate sandwich cookies! I'm very picky when it comes to biscotti, but I quite enjoyed these. While they take a while to bake, they are very easy and fun to make. The Oreo flavor is a very nice compliment to the lightly sweetened dough. Plus, they are scrumptious dipped in milk. It's a cookie within a cookie. I wonder, is it possible to go even further with that? Maybe, if I chopped these Oreo biscotti up and made new cookies featuring biscotti chunks… it would be a cookie within a cookie within a cookie. And that's just crazy. Preheat oven to 350 degrees F. Lightly grease a large baking sheet. In a large bowl, beat sugar, butter, eggs, and vanilla with an electric mixer at medium speed until well-blended. Stir in flour, baking powder, and salt. Stir in chopped cookies until evenly distributed. Divide dough in half. Shape each half into a 9x3-inch loaf on prepared baking sheet. Bake in preheated oven for 30 to 35 minutes, or until lightly golden and toothpick inserted in centre comes out clean. Remove from oven and let cool for only a few minutes. Cut each loaf diagonally into 15 slices, about 1/2-inch thick. Place slices, cut side up, on same baking sheet. Bake for another 8 to 12 minutes on each side or until lightly toasted. These look lovely and I absolutely loved your idea of Oreo cookies as an addition to the biscotti! I have never ever tried a biscotti and this looks like a perfect recipe to start with. I have bookmarked it. What a great idea! I've never actually had biscotti before and now I'm seeing them everywhere. Maybe it's time I try some. It's insane that you're in school until today. Do you really only have one week of vacation? 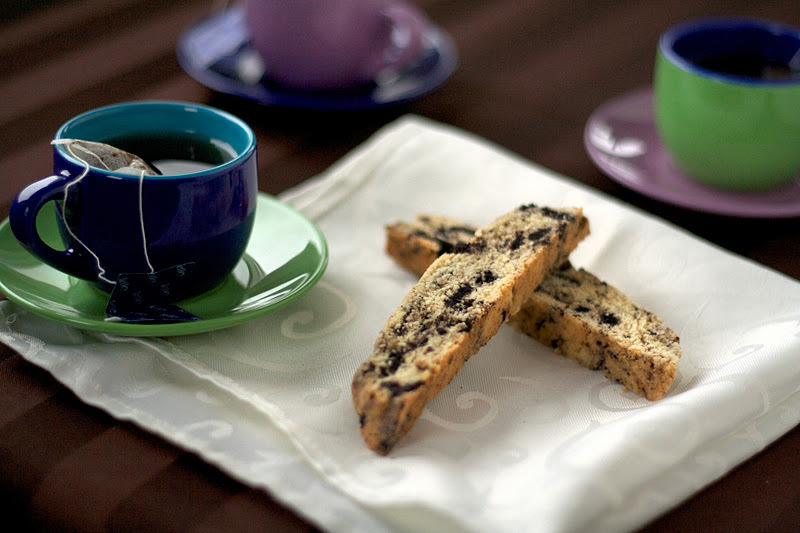 This is an amazing and delicious idea, Oreos in biscotti, awesome! And the photos are beautiful. Snow or no snow, here's wishing you and your family a very Merry Christmas! I'm not a huge fan of biscotti (too crunchy). However, Oreo biscotti could be a whole different story! Anything w/ Oreos sounds good in my book! Oreos do make everything extra tasty and the use of them in creating biscotti does sound like a winner! Cookie within a cookie does open things up to various combinations. Your biscotti slices tell me that it has been far to long since I have had a tea party. These would be the winner on the table no doubt-yum! 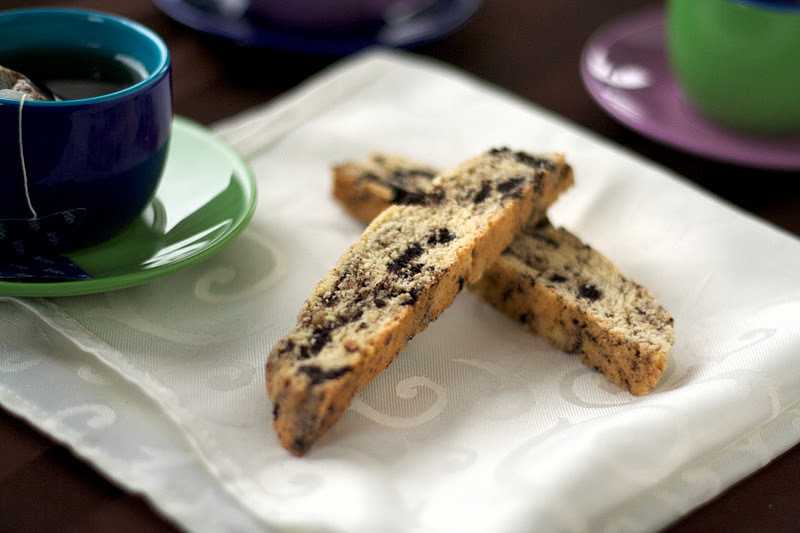 Oreo Biscotti sounds heavenly! Love the idea. Thanks for sharing! I meant to comment on these before Xmas but never got a chance. Love them! We didn't really have snow here either, although there were a few pretty flakes falling on Xmas morning. Hope you had a great Christmas and found your snow...Happy New Year! A few of these + a big glass of milk = perfect snack! © 2011, Bake Me Blush. All Rights Reserved. Ethereal theme. Powered by Blogger.